Alexander Payne may be the best director of films revolving around everyday folks with everyday problems working today. About Schmidt and Election work as black comedies and existential dramas simultaneously, and while many adore Payne’s Sideways, I’ve always believed Election to be his finest work. * Well, until The Descendants at least. Set on the islands of Hawaii, The Descendants details the conundrum that befalls Matt King (played wonderfully by George Clooney). His wife is in a coma after a boating accident, and he learns she will never recover. Matt and his wife both have Do Not Resuscitate documents, so the grieving husband must gather his two daughters (moody teen Alex and eccentric tween Scottie) and tell them the news. But before he can, he discovers his wife had been carrying on an affair before the accident. What begins as a journey to confront his wife’s lover turns into a lesson in forgiveness, honor, and moral strength. We’re in something of a golden age when it comes to handsome leading men who insist on meaty roles rather than easy paychecks. George Clooney, Matt Damon, Brad Pitt, and even to a lesser degree Tom Cruise and Ben Affleck all push the limits and go for interesting projects, and director Payne has a reputation for showing different sides of familiar faces. Just as we saw new sides of Jack Nicholson in About Schmidt and Matthew Broderick in Election, George Clooney displays a new side through the perpetually wounded and discouraged Matt King. It may not be his finest performance, but it’s certainly high on the list. The real revelation is Shailene Woodley as Matt’s eldest daughter, Alex. It’s an astonishingly raw performance from an actress primarily known for her stilted and wooden delivery on The Secret Life Of The American Teenager, and it floored me. Woodley certainly deserves more Awards kudos than what she’s getting. The film’s finest shot centers around her emotional breakdown underwater upon the news of her mother’s impending death, and Woodley sells it like gangbusters. Payne has always show proficiency for working with actors and complicated drama, and The Descendants is probably his most emotionally complex and thematically dense picture yet. Payne has the chops to pull it off in spades, and while there’s nothing particularly flashy or extravagant that screams “an Alexander Payne film!” this is a film that, with a lesser director, would veer into treacly Oscar bait. Payne keeps it away from all that and delivers a film that is well worth your attention, and any Awards attention is just icing on the cake. This is one humble movie, and that’s part of the charm. In a month that’s typically filled with studio dumps and leftover Oscar bait, The Descendants is a true diamond in the rough. The Descendants is now playing in theaters everywhere. *Double Feature Recommendation: Watch Ferris Bueller’s Day Off and follow it up with Election. The latter feels like a spiritual sequel, and particularly satisfying for those who see Ferris as a bit of a snot. 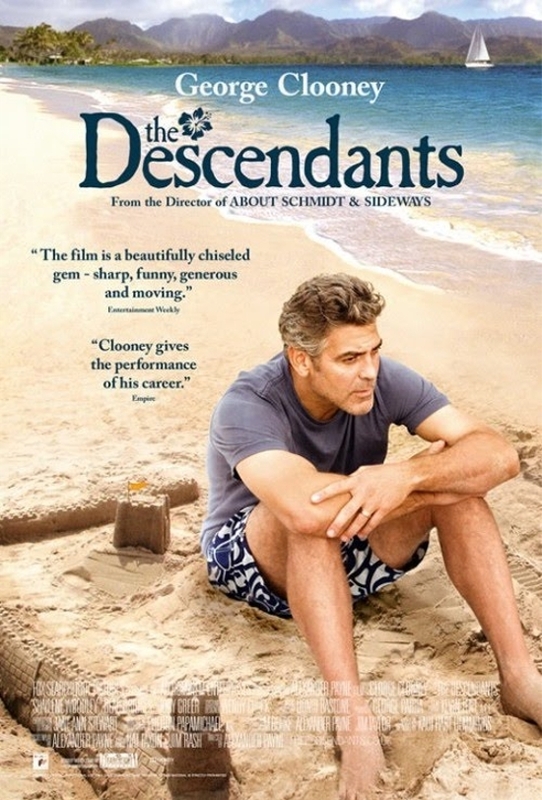 Comments for Review: “The Descendants” are now closed.